The number of MERS cases in the Buraidah cluster has risen to 20 today, with the announcement that two female expat Health Care Workers are now in home isolation identified as asymptomatic MERS cases. With three more fatalities announced today (2 in Buraidah, 1 in Taif), the number of deaths in the Buraidah cluster has risen to 8, with three of those in their twenties. 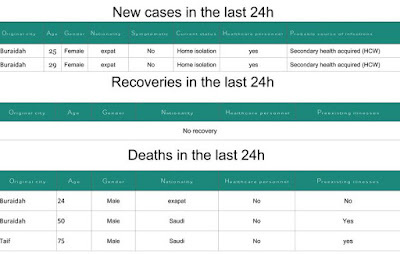 Below today's MOH List, I'll have a bit more on asymptomatic MERS cases, and why they matter. 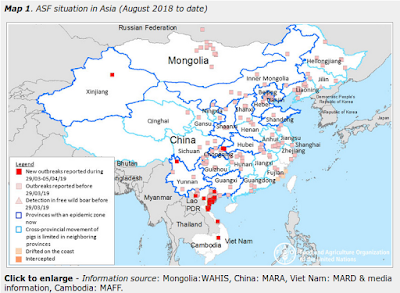 One of the big unanswered questions about the MERS coronavirus is what role – if any – do asymptomatically infected individuals play in the spread of the virus? While unproven, we've seen some evidence suggest they could be a factor (see Study: Possible Transmission From Asymptomatic MERS-CoV Case). For the vast majority of community acquired cases, the source of infection remains a mystery. Asymptomatic carriage and transmission to others is one plausible, if not proven, explanation. Part of the problem has been that – up until last fall, and contrary to WHO advice – the Saudi MOH didn't treat PCR positive MERS-CoV cases as `real cases’ unless they were symptomatic. The World Health Organization has released interim guidance on the Management of asymptomatic persons who are RTPCR positive for Middle East respiratory syndrome coronavirus (MERS-CoV) Interim Guidance, that calls for asymptomatic PCR-positive MERS cases to be isolated, and for their contacts be monitored as well. For the past 5 or 6 months the Saudi MOH has been reporting, and isolating, PRC positive MERS cases, regardless of their symptomology. But mild or asymptomatic cases are hard to detect, and most are only discovered as a result of routine contact testing during a cluster investigation, like we see currently in Buraidah. While the Saudis have only identified a little over 1330 MERS cases, a seroprevalence study published last year suggested that 45,000 or more may have been infected, which suggests only the `sickest of the sick' are apt to be detected.